Last week went by just so and so; there was one lovely day with nice, warm weather, and then we slipped back to our lately so usual grey skies and sleet and snow and today is just another grey one. Towards the end of the week, I felt that enough already and recovered little bit of my usual dose of energy. While going through my boxes of yarn (that can be depressing or uplifting depending on the mood; depressing when the mojo is gone, resulting in the thought that who in the world is going to use up all this yarn or uplifting when thinking of all the possibilities that lie sleeping in the boxes) I opened the box that contains most of my Finnwool and there amongst all the various colors lay two balls of Kauni Effektgarn. We have a small garden hut, I am not sure how to call it, but anyway, it is a small house with windows all around and that is where we eat on most days during the warm months; it does not even always depend on the weather, if it is chilly and rainy, we have a heater there. I will take pictures of it later on during the summer... Or, wait, I will go through my old pictures to see if I have any from last summer... No, sorry, just this one where you can see the blue corner. Anyway to make this long story a little bit shorter, I feel that I need to have something made of granny squares in that small hut. I took out both balls of Kauni, searched for the right size of hook and made the first adjustable circle and started crocheting these granny squares. I did not feel the love at first. I made two squares and then left the project sit for a day. The next day when watching TV, I made the third one. Then the fourth and then finally last night, I had to soak the squares (18 so far) to see if Kauni will get softer when washed, as it is a bit scratchy. So last night, after midnight, I was kneeling down on the bathroom floor arranging my squares on a towel to dry and then all of a sudden I realized that I was in love with the squares! And finally I was at peace with my world. 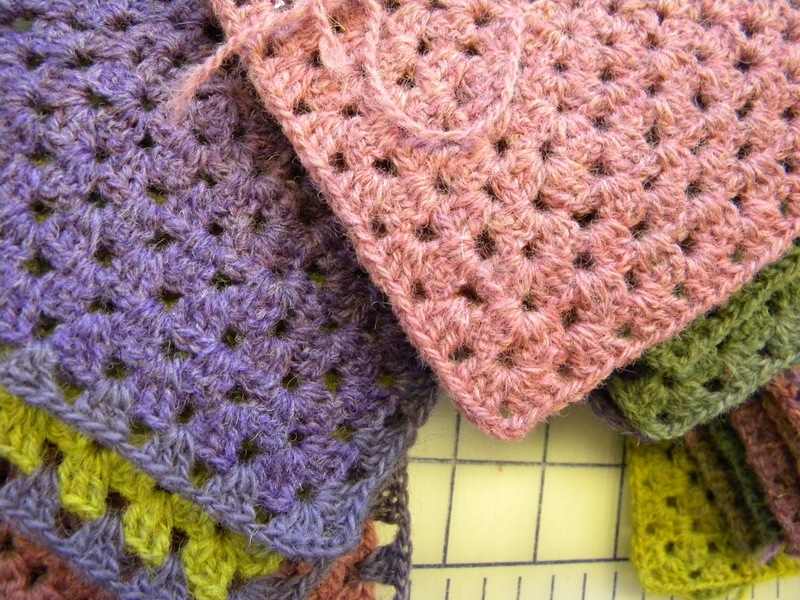 I would have never guessed that crocheted granny squares would work the magic --- and of course Kauni had something to do with it, just look at these cheerful colors. When my husband is away, Tina sometimes comes to my bed, and last night she looked at me with perky eyes and jumped on my bed. I am sure she can read my moods very well, we have lived together 8 years come next summer. and I think she was smiling with me. After a while she rested her chin on the bed and kept glancing at me every now and then while I read this crochet book. After half an hour though, she started to look a little bit annoyed, as if she told to me that please put out that light, so that we can get some rest before the sun is up again. So, this Sunday, it is grey and cloudy and cold, but hey, this is April, the summer will come eventually, and the snow will go away, it has done so every single year and will do so this year too. And I will take what is left of April one granny square at a time. PS. 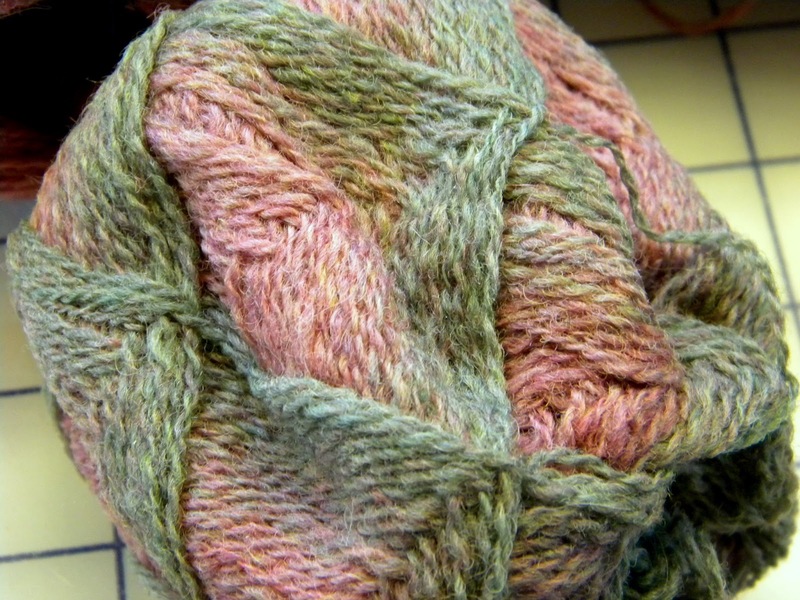 If you would love to see truly beautiful granny squares, go look here. 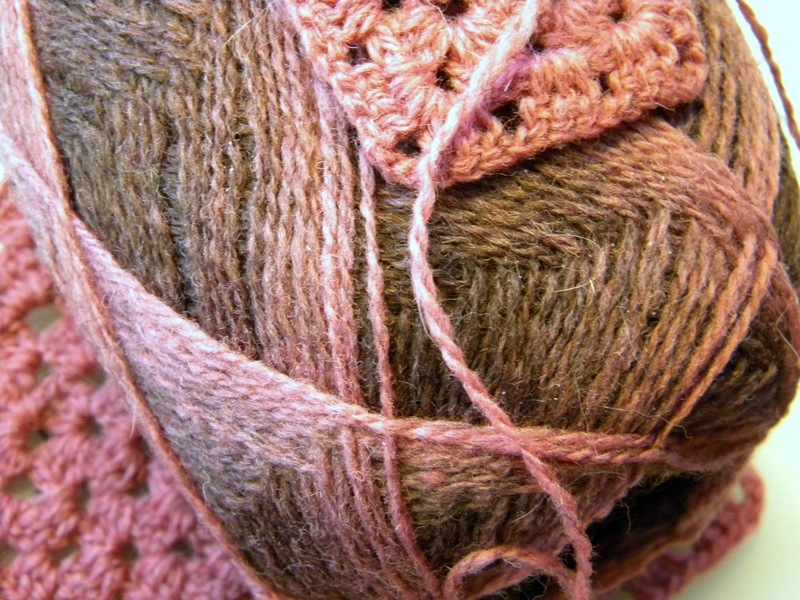 Your granny squares are beautiful. How many rows did you make each square? Love the granny squares and will be looking forward to the finished project! Also, love the little hut. I'm so glad you're feeling a bit better. 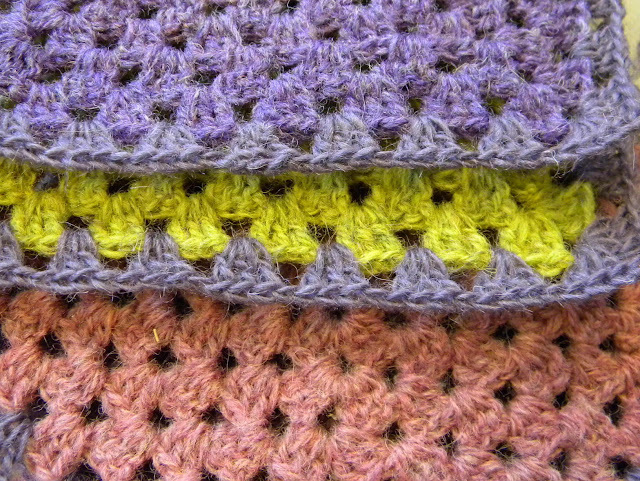 Granny squares in Kauni are lovely and inspirational, but then you often inspire me. It's funny what can bring us out of a funk. Once in a bad down period, a gift of an orchid started to turn me around. I laughed at your comment about the stash -- depressing when the knitting muse has left because "who in the world is going to use up all this yarn" or "uplifting . . . ." I get the same feelings myself. I think you have a lot of sisters in spirit! What a lovely idea - I shall look forward to seeing the squares all together and finished. I cant crochet for toffee but how I wish I could. 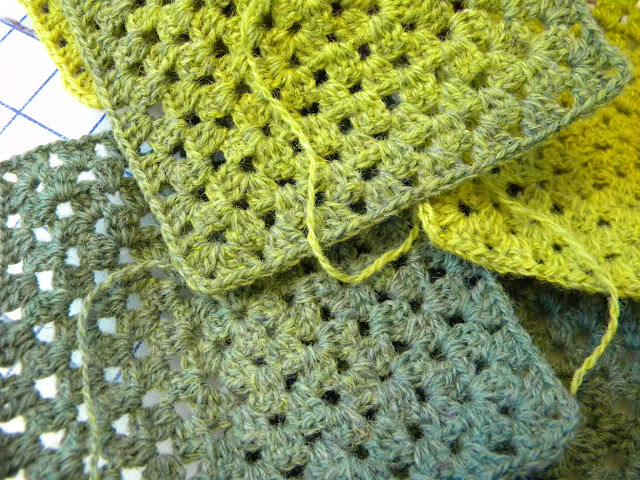 I am in love with these squares and absolutely cant wait to see the finished project. Lene, the weather here in Ontario Canada has been miserable and grey too. We had one week of a hint of things to come in March but since then cold, damp grey. Anyway, your squares are a perfect antidote. Lovely. omg your header is gorgeous! I love your granny squares I think I may need to take some time and make a few myself. I so love this post.... it is so true that a form of wellness can be found while doing something simple, repetitive. Today, there was snow on the ground, covering the daffodils and the tulips. It is humid, cold....but May is around the corner! I'm so glad you found something to entertain yourself, the colors look great! I really enjoy your works of art. I'm so glad you are feeling better this week. 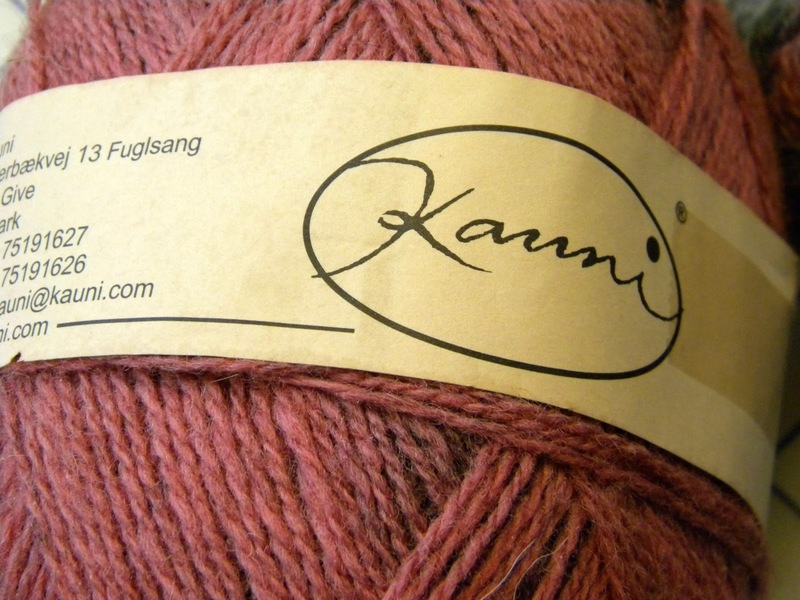 The Kauni you have has lovely cheerful colours in it. I'm taking the Flower Crazy class too. I wish I had more time, but work gets in the way. I'm having fun with it, though - I hope you are too. Sounds like what we would call a sunroom here in the US! Lovely, as usual! Your blog is inspirational. I love reading about your most interesting life. I loved the series you did when the days were getting shorter, and not I will see your beautiful lake thaw. This spring I also started a granny square afghan to chase the winter doldrums away. It works!